Mushroom poisoning is a frequent environmental health problem. 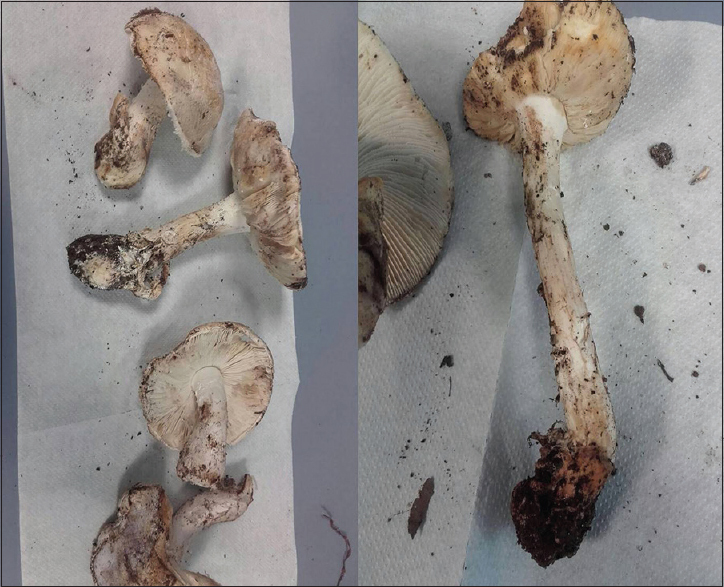 Acute kidney injury can be a consequence of eating mushrooms mostly after ingestion of Cortinarius orellanus group, and also mushrooms of the genus Amanita (A. proxima, A. smithiana, A bouderi, A. gracilior, A. echinocephala, A. neovoidea) can cause acute renal failure. A. proxima is a well-known cause of nephrotoxicity (tubulointerstitial nephritis with acute tubular necrosis and renal failure) due to norleucine toxin (aminohexadienoic acid), an allenic and non-protein, thermostable amino acid [Figure 1]. The first report of acute kidney injury related to A. proxima poisoning was described in 1994. Edible and toxic species of genus Amanita are often confused. A. ovoidea (Bull. : Fr) is a common large, white-colored fungus, often tinged with cream; often it causes severe gastrointestinal discomfort. Amanita proxima is very similar to A. ovoidea. Both A. proxima and A. ovoidea are widespread in the Mediterranean area. We report our experience about nephrotoxicity of A. ovoidea. In October 2017, a 49-year-old male, with previous normal renal function, collected mushrooms in a small forest, near Palermo, Sicily, Italy. He was admitted to the hospital because of nausea, vomiting, and anuria started 12 h after eating wild mushrooms. Four of his relatives ate the same meal but they remained asymptomatic. Renal ultrasound showed no hydronephrosis with normal size, and echogenicity. Blood pressure value was 180/100 mmHg. Laboratory examinations showed impaired renal function (creatinine 8 mg/dL, urea 220 mg/dL) and moderate hepatic cytolysis [aspartate transaminase (AST): 240, alanine transaminase (ALT): 390). No pathogens grew on culture of urine or stool. The remaining parts of the collected mushrooms (about 750 g) were examined by an expert mycologist who identified the species A. Ovoidea [Figure 2]. The patient was treated with metoclopramide, volume repletion, and furosemide without significant improvement in his symptoms. Therefore, he underwent hemodialysis through a temporary right femoral vein dialysis catheter for 10 days until the urine output increased with serum creatinine and AST/ALT reduction. Immunological tests and other microbiological investigations resulted negative. After 4 weeks, we observed the renal function normalization (creatinine 1 mg/dL). 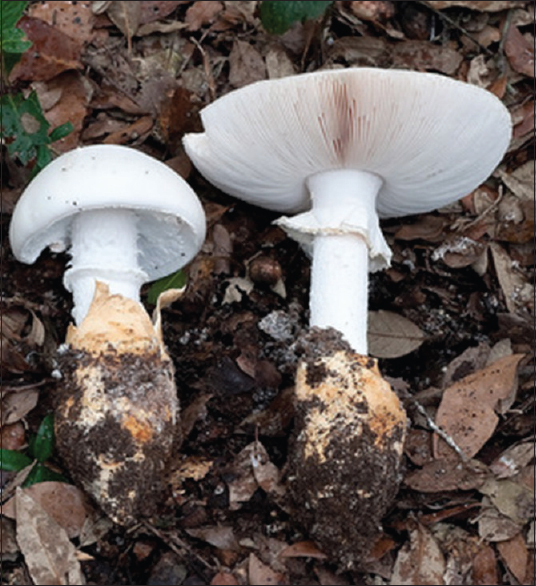 “Amanita nephrotoxic syndrome” is characterized by an early onset of gastrointestinal symptoms, mild hepatic damage, and severe but reversibile acute renal failure., A. ovoidea is a common fungus with little value. The edibility of A. ovoidea is dubious and there are known cases of poisoning that affected the gastrointestinal tract after eating this species. Some expert mycologists strongly advise against consumption. The awareness of nephrotoxic mushrooms of the genus Amanita is important for the medical community. Wessely M, Schönermarck U, Raziorrouh B, Jung MC, Samtleben W. Orellanus syndrome: A rare cause of acute renal failure. Dtsch Med Wochenschr 2007;132:1880-2. Kirchmair M, Carrilho P, Pfab R, Haberl B, Felgueiras J, Carvalho F. et al. Amanita poisonings resulting in acute, reversible renal failure: New cases, new toxic Amanita mushrooms. Nephrol Dial Transplant 2012;27:1380-6. Leray H, Canaud B, Andary C, Klouche K, Béraud JJ, Mion C. Amanita proxima poisoning: A new cause of acute renal insufficiency. Nephrologie 1994;15:197-9. Mancini A, Assisi F, Balestreri S, Angelini P, Bozzi M, Cuzzola C, et al. A rare case of acute renal failure related to Amanita proxima ingestion. G Ital Nefrol 2015;32. pii: gin/32.4.10. Courtin P, Gallardo M, Berrouba A, Drouet G, de Haro L. Renal failure after ingestion of Amanita proxima. Clin Toxicol (Phila) 2009;47:906-8. Available from: http://www.funghiitaliani.it/topic/7919-amanita-ovoidea-bull-fr-link-1833/. [Last accessed on 2016 Mar 05].